Fall means Harvest-time in Wine Country; but once grapes are safely fermenting in their vats and tanks, wineries turn their attention indoors where caves often feature prominently in a variety of spectacular holiday events: tours; elegant and educational food pairings; barrel and library tastings; even live performances. 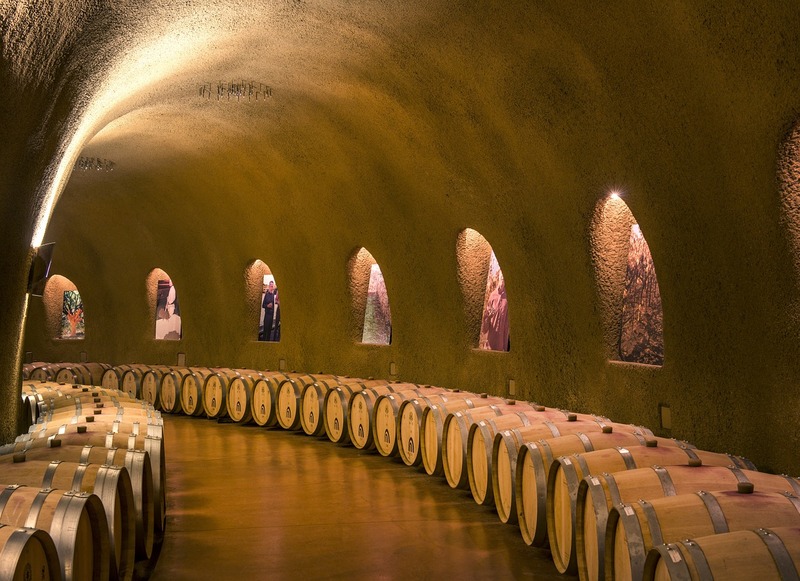 Caves offer a mix of romance and utilitarian purpose that provides everything wine loves: controlled moisture, stillness, darkness, and a consistent chill between 52°F-58°F*—perfect for aging wine. (*Below 50°F hampers natural fermentation; above 60°F accelerates it.) People have used naturally cool subterranean caverns to store and age wine for millennia, as many historical landmarks worldwide attest. 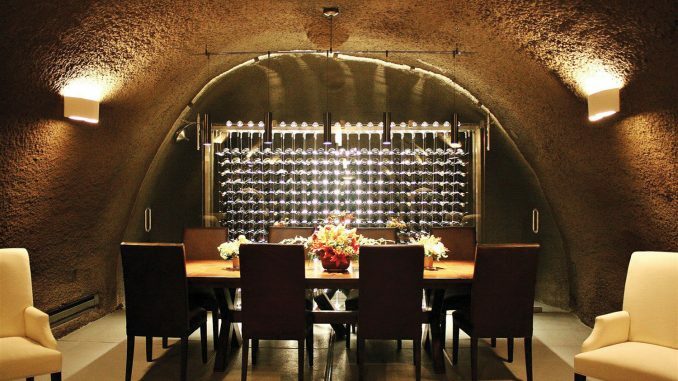 In-home Cellars are closest to replicating cave conditions and IWA’s Design Center offers examples from around the world. The best part? Our design services include free consultations; often no-charge architectural drawings; and thermal load calculations to make sure the right cooling systems (or units) are protecting your important investments. With a myriad of sizes and styles, racking systems, layouts, materials, and wood stains, get a jump on Santa and visit IWAwine.com or call 800.527.4072 “tout suite” ! Once that cellar’s underway, consider refreshing nearby areas, too. IWA’s large array of home furnishings fit both formal tasting environs and or pure entertainment purposes, such as our wine barrel pub table and stools with legs made of barrel staves. Prepare for ooh’s and ah’s as you remove pristine sets of Riedel Sommeliers Tasting stems for each guest, a deluxe Laguiole En Aubrac opener, a special cork cage bottle topper, plus a can of Private Preserve—from right inside the barrel! 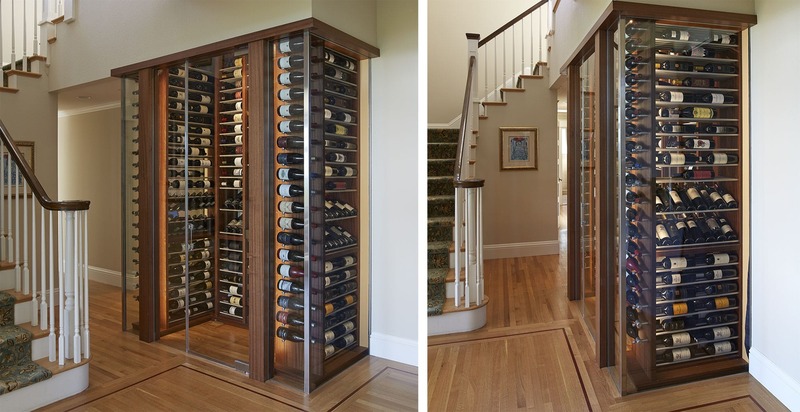 These days, cooling wine cabinets are all the rage: professional storage conditions with a manageable footprint. For premium cabinets, we love both the sleek and modern Transtherm and the heirloom-worthy Le Cache brands. Both keep wines nippy while you stay warm and cozy the whole winter long. AMBIENT TEMP, DIRECT SUNLIGHT, & VIBRATION NOT AN ISSUE? 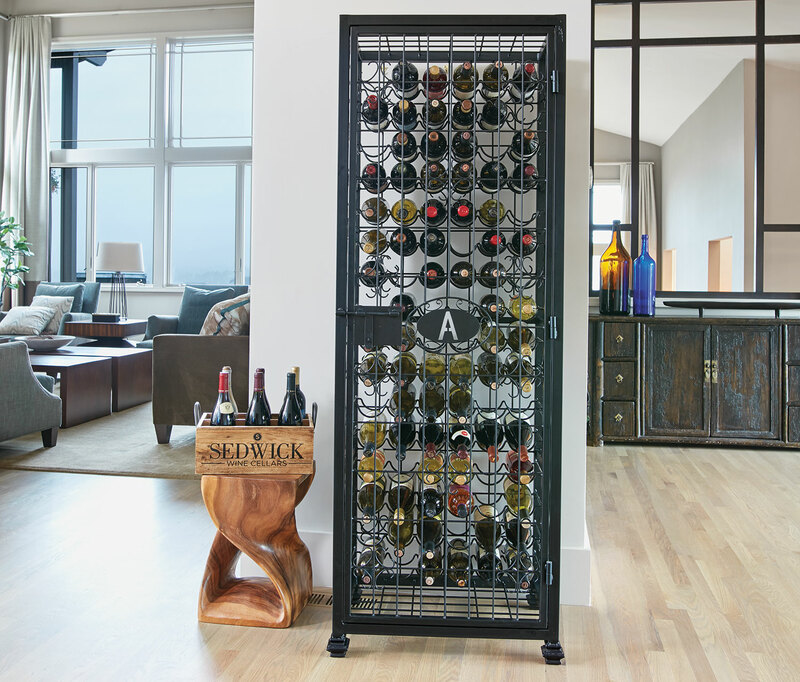 Free-standing storage racks and wine jail cages may be more your speed: no electricity required. Ever hear of a Cork Cage? 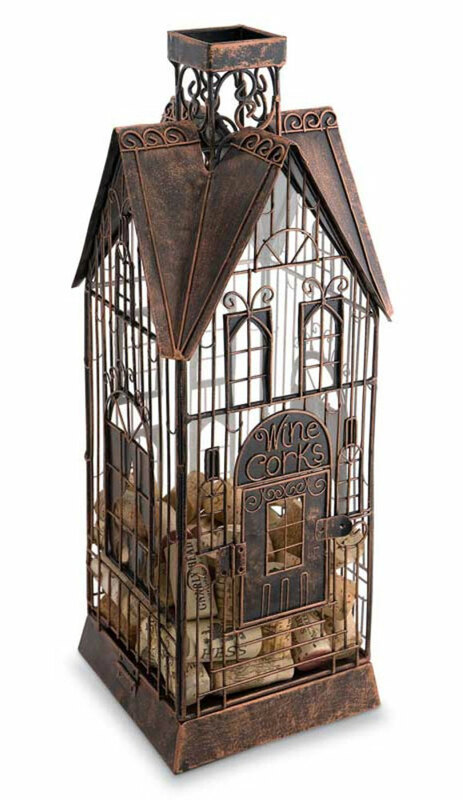 These clever wire-framed sculptures resemble bird cages, but inside these beauties, you won’t find any turtle doves or partridges, just corks. The barrel shaped cage fits the mother lode at 170 corks. (Now that’s what we call celebrating!) And a slew of other fantastic shapes hold a third or half that amount. 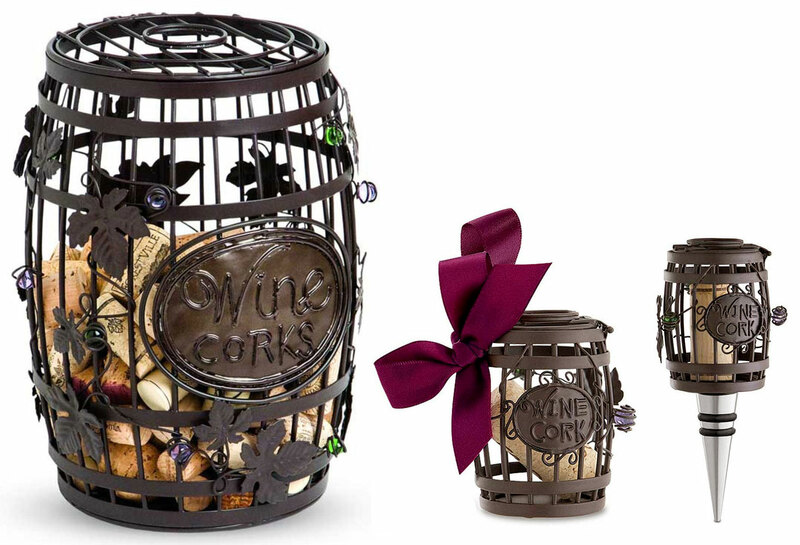 In fact, our cork cages are so handy, you won’t limit them to just corks; and they’re so appealing, you’ll want to display them everywhere! 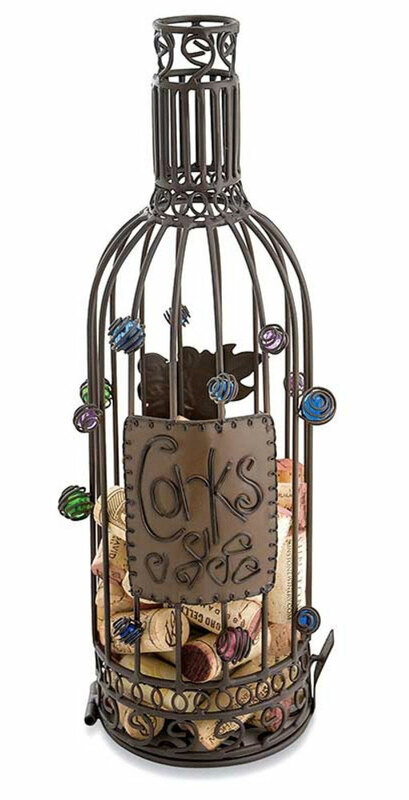 Once filled, dump that cage and get to assembling a great-looking wood-framed trivet or an even better-looking push-pin bulletin corkboard with IWA’s easy-peasey cork kits! Each kit includes everything, except for the corks you will need. 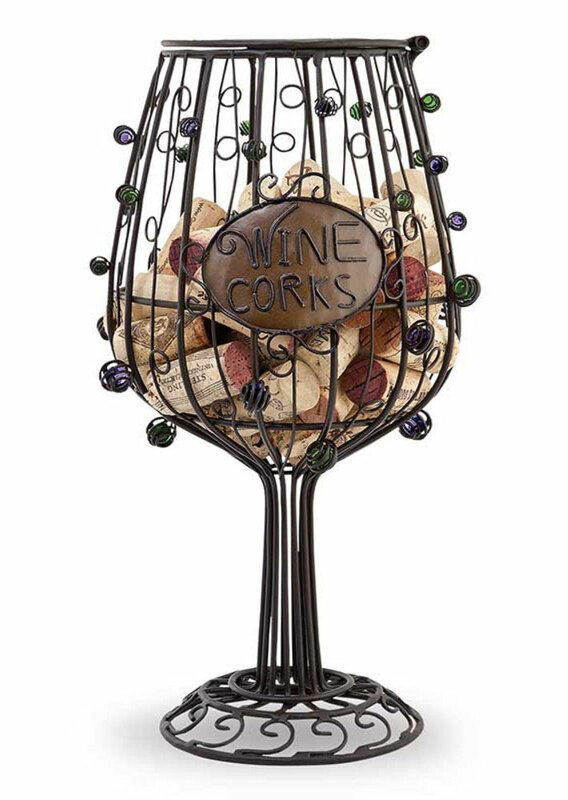 Just when you thought you couldn’t top that, you can, literally, because many cork cages are also available as a Bottle-Topper or Ornament. Pop in a keepsake cork from a favorite experience and remember that bottle over and over again. Great for stocking stuffers! IWA always carries wine fridges in a range of shapes and sizes, but did you know wine preservation systems offer affordable and practical storage alternatives? If you entertain often, consider the Winekeeper: it inserts inert nitrogen (or argon) to prevent oxidation and keeps wines fresh for weeks. Available in both single-bottle units and deluxe multi-bottle bar systems, you can open multiple bottles at a time, worry-free! So with your home storage challenges solved, why not get out and celebrate by stocking up? Nothing breaks up routine and refreshes the collection like a holiday wine country visit. And caves mix it up, adding interest and fun to any tasting itinerary. For inspiration, a few personal favorites below. ALONG ALSACE’S ROUTE DU VIN, France’s oldest wine route. Check out the Cave Historique des Hospices de Strasbourg where a 14th-century wine cellar (boasting a barrel miraculously preserved since 1472) sprawls beneath a modern hospital. Caves Patriarche: A magnificent staircase, labyrinth of tunnels, and vaulted rooms tucked away under town showcases the most prestigious Burgundies: Meursault, Corton, Beaune, Pommard, Nuits-Saint-Georges… and on and on. East of Barcelona is home to many of the biggest Cava producers. 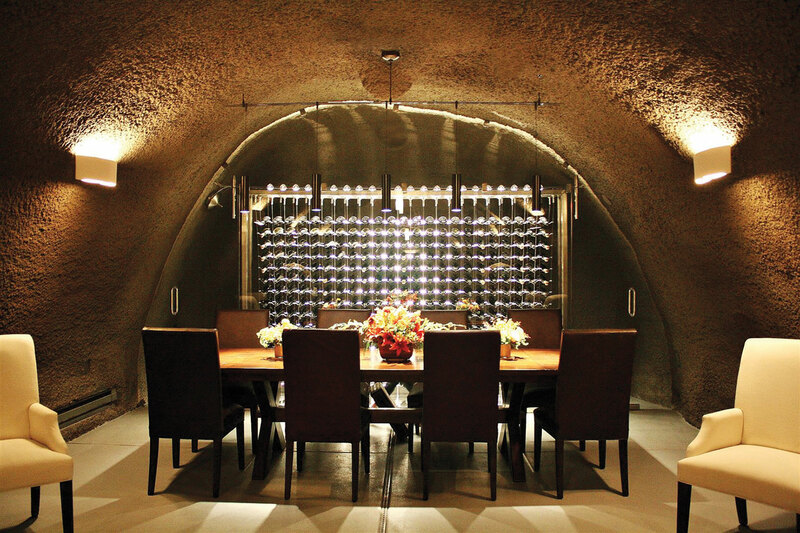 Tour vast underground aging cellars that offer various combinations of tastings, food pairings, and activities. Dramatic, cave-like architecture built into an ancient hillside monastery, Argos in Cappadocia is near centuries-old civilization and Turkey’s lesser-known Syrah, Muscat, and Kalecik Karasi (like Pinot) winemaking region. Keepin’ it local? No problem! As a former Napa resident, Pine Ridge always hosted a holiday cave event as did Clos Pegase, Domaine Chandon and countless others. This handy resource from California’s Wine Institute lists more holiday wine cave festivities and will have you shouting EUREKA! in no time. Seattle-based writer, Lori Stevens, loves to tour & taste in wine caves around the world.